For decades, scientists have observed the phenomena known as El Niño and La Niña. Both significantly impact the global climate and both pose a puzzle to scientists since they're not completely understood. Now, a new study clarifies some of the obscurity surrounding El Niño and La Niña, which together are called the El Niño Southern Oscillation (ENSO). This new study examines ENSO frequency asymmetry during the phases of the Pacific Decadal Oscillation (PDO), a climate pattern in the North Pacific. 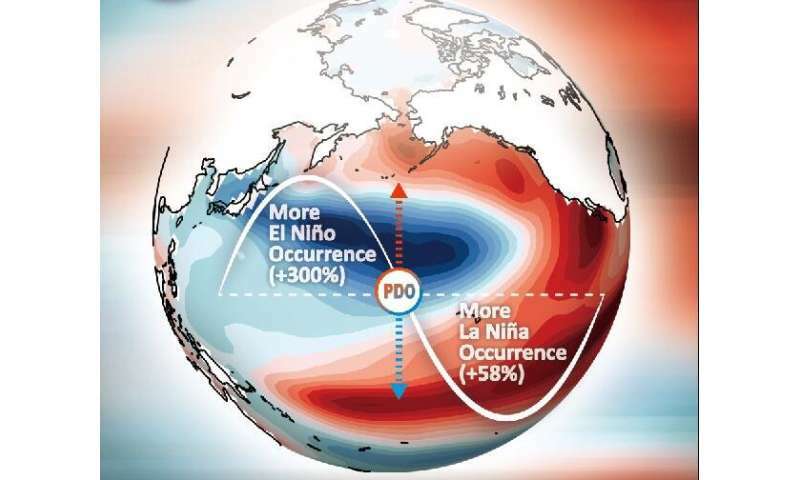 Previous studies have investigated the relationship between ENSO and PDO, but none have examined whether the warm (positive) and cool (negative) phases of PDO in the North Pacific influence the frequency of ENSO events in the tropical Pacific. "For the first time," said Prof. ZHENG Fei from the Institute of Atmospheric Physics, Chinese Academy of Sciences, and co-author on the study, "we have quantitatively demonstrated that El Niño is 300 percent more frequent than La Niña in positive PDO phases, and 58 percent less frequent in negative PDO phases."